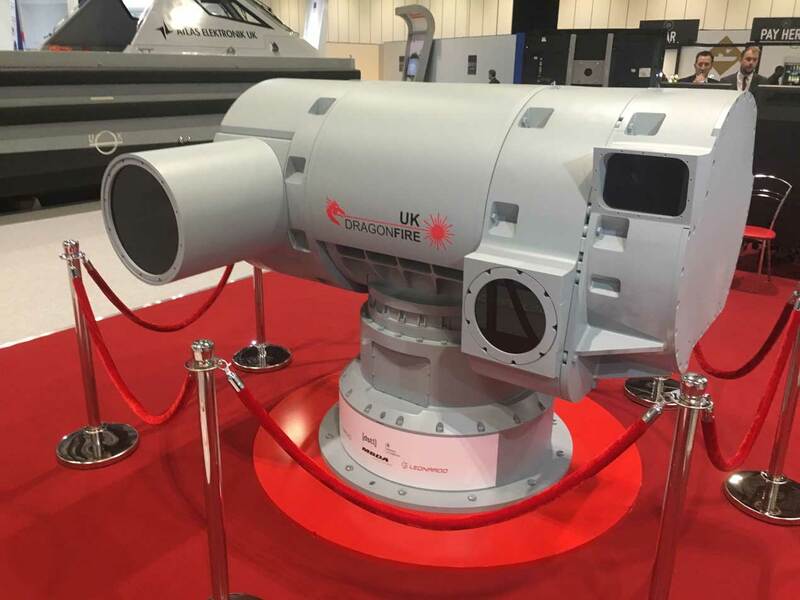 The new laser weapon demonstrator being built for the UK Ministry of Defence was unveiled for the first time by the UK Dragonfire consortium at DSEI 2017 in London. Led by MBDA, under contract to the Defence Science and Technology Laboratory, Dstl, UK Dragonfire is a grouping of the best of British industry brought together to develop this advanced and complex new programme for the UK Armed Forces. For the first time, the consortium revealed the design of the turret—known as a beam director—which will be used to trial this new technology. The beam director, provided by Leonardo, brings together QinetiQ’s powerful laser emitter, as well as electro-optics for target identification and tracking. MBDA is bringing prime weapon system delivery experience and advanced weapon system command and control (C2) and image processing capability to UK Dragonfire, in addition to co-ordinating the overall effort. Known as the Laser Directed Energy Weapon (LDEW) Capability Demonstrator Programme (CDP), the effort will see UK Dragonfire trial this new sovereign capability in the maritime and land domains in 2019. Among the uses of LDEW systems are providing very short-range air defence capability, close-in protection for naval vessels, counter-unmanned aerial vehicles (UAVs), and protecting friendly forces from mortar and artillery attack. A key benefit of the Dragonfire LDEW technology is that the base system is highly adaptable and its effects are highly scalable. As such it offers a range of different engagement solutions depending on the tactical scenario, these include tracking, deterring, dazzling the sensors of a potential threat, up to damaging or destroying it. Watch the video below of a test laser melting a mortar bomb. UK Dragonfire was awarded a £30 million contract for the LDW CDP in early 2017. But it is the US Navy that is leading the charge when it comes to the development of directed energy weapon systems. In November 2014, a 30 kilowatt Laser Weapon System (LaWS) was demonstrated on board the USS Ponce. In 2012, LaWS downed several unmanned aircraft. The Office of Naval Research is also believed to be preparing to test a 150 kW weapon system in the near future. ONR says navy leaders have made directed-energy weapons a top priority to counter what they call “asymmetric threats”, including unmanned and light aircraft and small attack boats that could be used to deny US forces access to certain areas.